Step 2 In a large, heavy-bottomed soup pot, add the fish stock and bring to a boil over high heat. Add the potatoes, cover and simmer for 10 minutes, until somewhat softened but not cooked through. Add the peas and cook an additional 5 minutes. Step 3Add the chunks of fish, ham, shrimp and sherry. Bring the soup to a boil, then reduce to a gentle simmer. Step 4With the blender running, ladle about 1 cup of the hot broth from the soup into the emulsion in the blender and blend until smooth. Remove the soup from the heat and whisk the emulsion into the soup. Add salt and pepper to taste. Serve immediately. The soup can be reheated, but do not boil. This makes a generous 2 1/2 quarts of soup. In Recipes-list.com we have selected the most viewed recipes from category - Fish and shellfish Healthy eating Soups . Enjoy the best recipes specially selected for you! 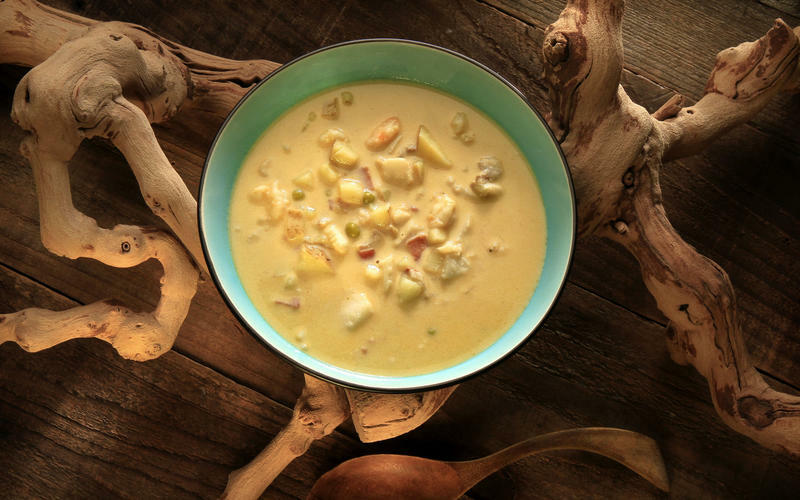 Andalusian seafood chowder (Gazpachuelo con pescado) is the right choice that will satisfy all your claims.